The British Bear Collection is a unique collection of Teddy Bears portraying the history of British Bears and Bear-making throughout the last century up to the present times. 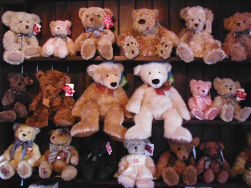 All the major manufacturers are represented in displays of Bears big and small, old and new, famous and not so famous! They are joined by many other "furry friends". The Collection is now on loan to Wookey Hole Caves limited. For further details please visit www.wookey.co.uk or telephone (01749) 672243. "See if you can find your own special "furry friend" on your visit!"